The newest member of our team, Jonathan Fernandes, is pretty wise when it comes to making practical life decisions, like investing your hard-earned money. He’s been a wonderful asset to our team as the Office Manager, and in this guest post, he shares some great ideas on how to use your tax return make so much sense! We are already in month two of the new year which means soon some of us will get a check back from the government and for some of us, it is a great time of the year were we get our hands on “a lot of money at a single point in time.” In my youth, I have spent that money on the fun stuff: like a new XBOX, some games, a new computer and even the ridiculous (like this coin sized tracking device for $20!). Although, as I have gotten older, I have noticed a slight change in how I spend my return. The point of my spending used to be just the fun stuff and things for myself, and now they can sometimes range from investing, saving, to even generosity. Let me throw out a full disclaimer though: I do work for an auto shop now and that is something I will talk about and nope, I’m not getting paid to mention some of the other things. So before you pull out your checkbooks and buy that 72” Ultra 3D HD LED FDIC FDAC HDTV SASS, let me offer a list of five great ideas for spending your tax return. It is no secret to our current economy. To stay competitive in most fields when it comes to finding a job requires education and credentials. Investing in a child’s future is an incredible gift when the time comes. It shows forethought and a deep sense of care and planning on behalf of the recipient. The best part, you don’t even have to be a parent to do it! This could be an education fund you created for them in a 529 plan, whole life policy, or even Florida prepaid plan. I personally had an Aunt float some funds my way when I was short on supplies and the occasional “I’m short on rent” college moment. You can probably guess who is on my Greatest Aunt’s of All Time list. My wife and I have been super happy with our friends who set up our education plan for our son, so give me a ring if you need to sit down with someone to help you get started and walk you through the pros and cons of each option! This one is nobody’s favorite but is a crucial one. A lot of times when I do the math with someone, they don’t realize that they can actually save money by paying off their debts. I once was helping a friend look over their finances and found that they were paying $35 a month on their credit card bill. Here is the fun kicker though, based on her credit card limit and the percentage she paid in interest, she literally was only paying interest off each month. Her credit card was going to stay maxed till the end of time. This applies to items like a loan on a car. Putting another big “down payment” on your car loan can mean greater savings in the long run. This truth is now backed by science. We know that when we give, whether it be our time, money or energy, there are many healthy benefits to it. One simple study showed that generosity in the elderly helped them combat depression. So let me challenge you like I was challenged by my pastor. If you think this is me looking to get money for charity, find someone in your community with a tangible need. Take some of your tax return and meet that need with one condition attached, “Paid in full.” Let them know that nothing is expected in return and tell me what your heart does when their faces light up. Write back and tell me how many tears that single mother shed when you told her that her hospital bill was paid in full. Tell me how many friends that struggling college student told when his computer was paid in full. Our cars are a huge lifeline on how we keep our life on track. They get us to work and they are how we shuttle our families to where they need to go. They are an incredibly important investment yet we rarely keep a fund to take care of them. A common figure we will see after doing some research is $100 a month. Here at Marinelli Auto Service, we think that is a good start. So this tax season, set $1200 dollars aside for the year or get a trusted mechanic to do a comprehensive vehicle inspection for you car and address the most urgent repairs. You will be happy you did in the long run! What good is a return without having some fun, right?! Take a portion of your return, grab someone you love and spend that money on something fun for the both of you to enjoy! Or how about a small weekend getaway? Even two days away from dishes goes a long way for me. Or if there is a little prankster in you like me, spend in on something fun! 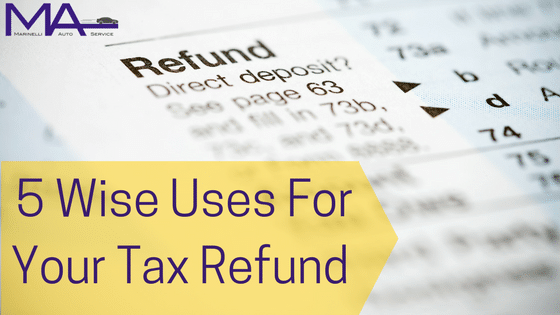 If you are planning on using some of your tax return on one of these categories, let us know! We love hearing stories about giving, investing and having fun!